Seems unlikely but, by chance, is this the same Brian Johnson who co-authors with Ekhart Tolle? I don’t think so, this is his Amazon page: http://tinyurl.com/y8serh7q. I have a generally favorable view of this post. I’m grateful to be a citizen. Powers in conflict kill a few, or millions, to make an example, to gain wealth, territory, to send a message – to impose ideology, to strike fear in the hearts of ordinary citizens, to keep them in line, to convert them, enslave them, gain their loyalty, etc. State imposed altruism is not voluntary, it’s a threat. Voluntary altruism, like Socrates, sounds Christ-like (if I choose to also view the flip-side of self-sacrifice in a humble beneficial pay-it-forward sense). The opposite of a threat. And I do. 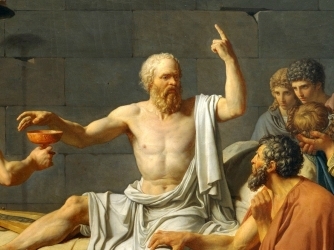 Socrates sacrificed himself for the what, the Polis? The Demos? (both in conflict), future Philosophers? Perhaps all of these and more. Perhaps something is to be learned through conflicts. So I try to have respect toward both the cities and the fly-over states. If I have a dwelling, I try to be diligent in protecting it and its inhabitants by locking its doors. Citizen of city, state, nation, world, … infinite cosmos.